Why is Clementi Labelled Pasir Panjang? I had a couple of 2nd shot targets in the South Buona Vista area and in my bid to find two of them (I failed), I stumbled upon a surprising find at Kent Ridge Park. 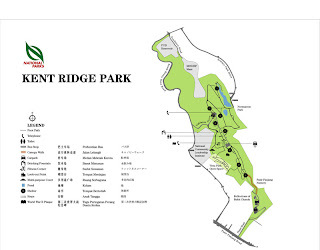 From the Nparks website, Kent Ridge Park is famous for the canopy walk linking it to the museum Reflections at Bukit Chandu and decommissioned military vehicles on display - M114 artillery guns and a AMX-13 Light Tank. I have known them from previous visits to the park, but this visit yielded an important discovery. In fact, the website does hint of it vaguely, but it is easy to be overlooked among other more popular activities. The website also does it injustice by not highlighting it in its official map online. The signboard maps in the park do, however. This is a map from another website, showing what's missing in the official version. Can you spot the difference? 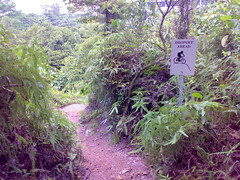 Lying on the slope of Kent Ridge Park, away from the well-trodden paths of the Park, lies Kent Ridge Park's very own Mountain Bike Trail! This is surprising because I'd never imagine Kent Ridge Park to have one like Bukit Timah, Ubin or Sentosa where their land contour is a natural candidate for a mountain bike trail. I thought the hilly slopes of Kent Ridge Park is but natural vegetation and there is no way up the Park from South Buona Vista Road other than Vigilante Drive. 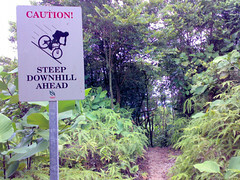 It therefore came as a surprise when I found myself at the bottom of the slope, beside South Buona Vista Road, by following the trail on the top of the hill. To be honest, the trail got me excited because it is deja vu once again. I've lost track of my frequent walking miles from those years, up the hill, down the slope, day or night we be there. I have walked on countless similar terrain like this, but the ground was surprisingly dry that day. It would be muddy and slippery last time. I think the biking trail is out of bounds to hikers for safety reason, but alternatives are available in our green country. 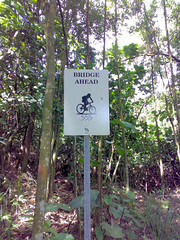 Which is why the trail is attractive to me - it is easy to get lost in Bukit Timah or MacRitchie forest trails but this one is pretty short and part of it borders the road. 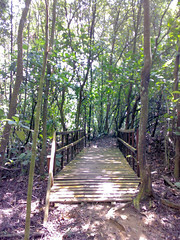 In comparison, the MacRitchie trails can easily take a few hours. 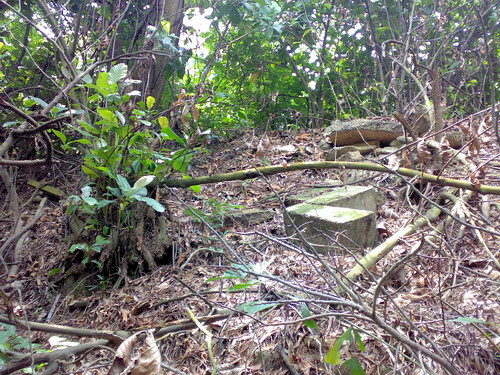 Along the trail, I found man-made remnants on the top of the slope. I'm not aware of any buildings or structures on the slope. Does anybody have any clue? 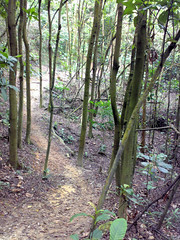 I'm surprised to find such a nice trail on the slope of Kent Ridge Park. 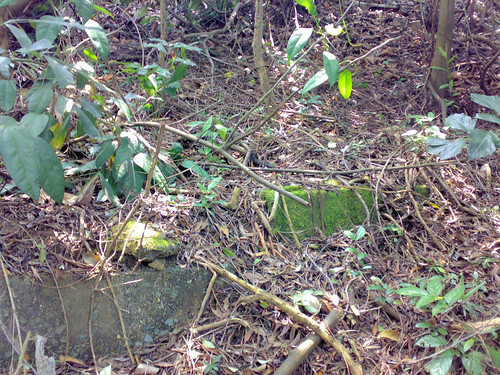 Finding the remnants is a bonus, for they might be clue to a building that once stood on the top of the hill. During World War II, a hill in the park was the site of one of the last and fiercest battles fought by the Malay Regiment against the invading Japanese army, the Battle of Bukit Chandu (also known as the Battle of Pasir Panjang), 12–14 February 1942. The first settlers arrived in Singapore in the early 19th century, they grew crops such as rubber, pepper, gambier and pineapple on the ridge. During World War II, it was used as a fortress by the British in the defence of Singapore. so my guess is that, the remnants you saw were part of an old fort that was used during the war. HI I was there yesterday but I could not locate the bike trail. May I know where is the bike trail? Thank you. Sorry for the late reply. You can see the map I posted in this blog for the trail. 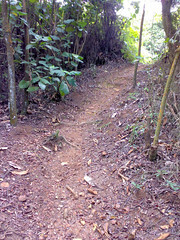 The easiest way is to access the trail from the top of the hill near Vigilante Drive.